I'm in love. Absolutely in love with these cinnamon rolls. Even the chocolate cinnamon rolls that I made at the beginning of the year cannot hold a candle to this recipe. 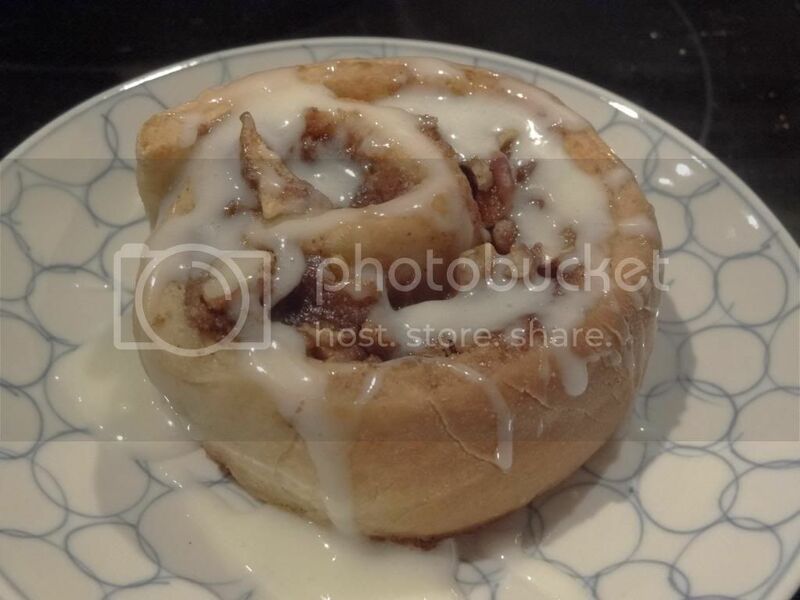 If ever there was a must-make cinnamon roll recipe, this is it. 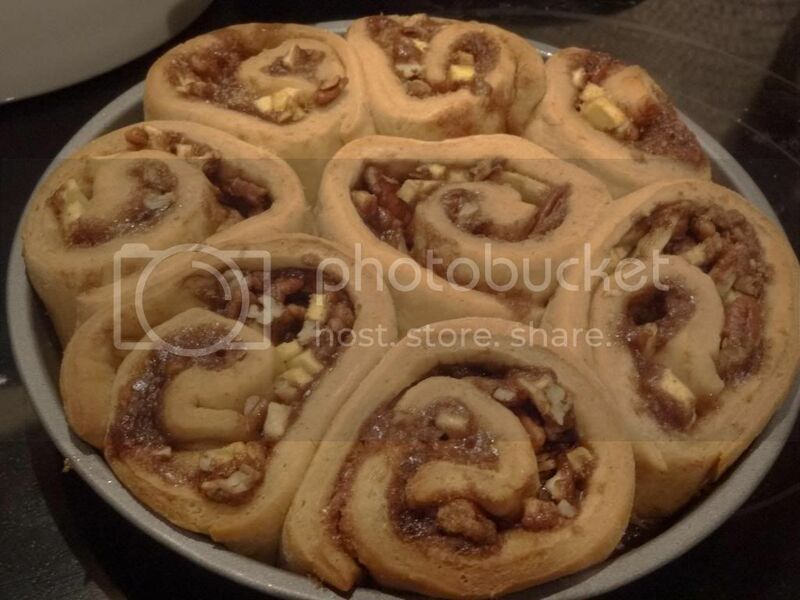 Let me be perfectly clear--you want to make these cinnamon rolls and you want to make them NOW!!! Just a little background...Early last month we went apple picking in Northern Virginia. I came home with at least 20 pounds of apples. Though I had a ton of plans on what I wanted to bake/do with them all (pies, preserves, bagels, etc. ), for whatever reason we've mainly snacked on them. Oh, I also made pancakes one morning, but that's about it. Don't get me wrong--I will eventually get around to baking at least a few things, particularly for Thanksgiving, but for now I seem to be drawn to quick and easy recipes. Sunday proved the exception. Although this recipe is incredibly easy, it takes some time and patience as the dough must rise. My recommendation is to throw the dough in the breadmaker first thing in the morning and they'll be ready for brunch. Either that or you could make them in advance and warm them in the oven before serving. These were so good that by evening I had to toss the remaining rolls in the freezer as both my husband and I had eaten two each. This recipe is a combination of a whole wheat sweet dough recipe found in Bread Machine Magic and the filling and topping are from this Taste of Home recipe. The only change I would make next time would be to use less sugar in the filling. The rolls are amazingly yummy, but if they weren't quite as sweet, I could probably eat more that one in a sitting. Kidding! (sort of.) Consider what type of apple you are using and sweeten accordingly. Remember that if you prefer them glazed, you will have that sugary goodness and may want to go easy on the sweetness in the filling. However, if you're all about sweet, by all means make the recipe as written. For dough, combine all dough ingredients in the pan of your bread machine per the manufacturer's instructions. Set to "dough" cycle. In last few minutes of the dough cycle prepare the filling by combining sugar, flour, salt and cinnamon. Cut in butter until crumbs formed using a pastry knife or two knives. Spray or grease baking pan(s)--I used two 8" rounds. When dough is ready turn it our onto a floured surface and roll into a 9 x 18" rectangle. Sprinkle with crumb mixture being sure to leave a 1/2" edge all around. Top with apples and pecans. Roll into a log and cut into 8-10 rolls about 1.5" thick. (Unwaxed floss is recommended.) Load rolls into baking pans--I prefer them touching but it's up to you. Cover and let rise in a warm place until doubled in size--about 30-45 minutes. Bake in a 350 degree oven for 20-25 minutes or until golden brown. Meanwhile,whisk together sugar and milk for glaze. Serve rolls warm drizzled with glaze, if desired.